Larry seemed to feel that his wine collection was taking over and it was time for a group dinner, so he invited us over for baked ziti, fondue, and a sunset. Shawn, Sanna and William came too. 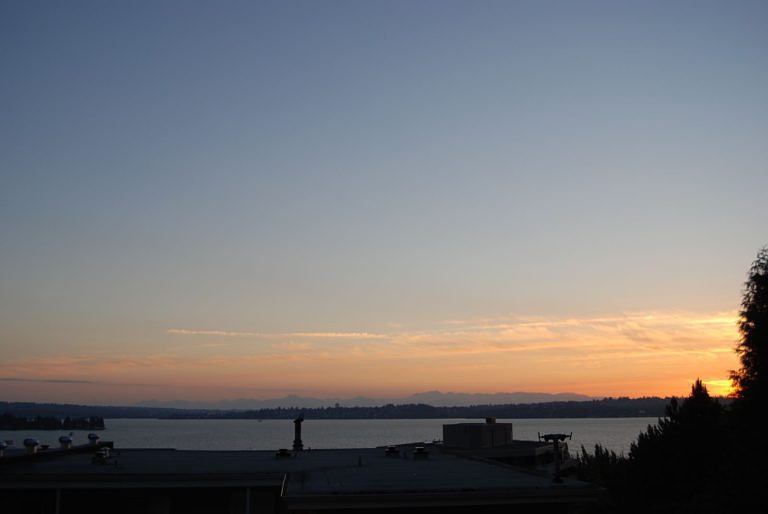 The view (Olympic mountains, seen over Lake Washington and Seattle) was great. Hazy around 8 pm, then misty with great mountain differentiation –- usually the Olympics look like a solid block, but every now and then you can see which mountains are close and which are more distant. The clouds made for a great orange sunset – peaceful and spectacular. Kevin and I have made a pledge to intrude on Larry more often. I miss seeing the Olympics and the lake (one of very few downsides of our current house). ps. We spent a while driving through our old neighbourhood. Building has not slowed down a bit. There’s a new three story condo development on our old block, two entirely new monster houses in place of the old 800-sq-ft postwar variety, and five or so finished (and sold, moved in) houses where there were construction sites back in November. Crazy.